First off, happy book day to my friend Lisa Shearin, whose book All Spell Breaks Loose [Amazon | B&N | Mysterious Galaxy] is out today. And last week marked the release of Mira Grant’s Blackout [Amazon | B&N | Mysterious Galaxy]. This year will be my first Worldcon, and the first time I’ve voted in the Hugos. I’ve been diligently downloading and devouring the Hugo Voters Packet, starting with the short stories, because … well, they’re short! As a joke, this was marvelous. 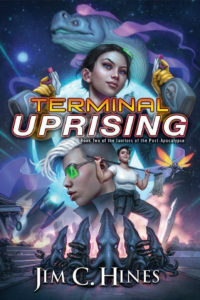 Tor and Scalzi went all out, including cover art, and the story was an amusing read. It’s nice to see humor on the ballot. And there’s an actual story here amidst the jokes and the over-the-top fantasy tropes. I can honestly say that when I finished reading, I wanted to know what happened next. You could tell Scalzi was having a good old time with this one. That said, some of the humor felt a little forced. While it’s a fun read and you should check it out, I don’t see this one taking home a rocketship. Movement by Nancy Fulda. This is a first-person SF story set in the near future about a girl named Hannah with temporal autism. Hannah’s parents are trying to decide whether to pursue a new technology which could help her integrate into society, but becoming more “normal” isn’t always a good thing. This made me think of Elizabeth Moon’s award-winning novel The Speed of Dark, which I reviewed here. Like Moon, Fulda does a very good job of capturing her protagonist’s voice, showing us the world through Hannah’s eyes. As the father of an autistic child, it’s hard for me to be entirely objective about this story, but I really appreciated it, and I thought the ending worked well. Also, even though Hannah doesn’t think it’s terribly effective, I totally want to invest in shoulder-mounted mosquito-killing laser technology! The Homecoming by Mike Resnick. Resnick is one of the most prolific writers in our field, and “The Homecoming” has a lot going for it. It’s an emotional story of an estranged son (Philip) coming home to visit the father who wants nothing to do with him. His mother has Alzheimer’s, and has only a few lucid minutes each day. Philip left Earth years ago, after radically redesigning his body into an alien form, in order to explore another world. His father took it as a rejection of family and humanity. To me, it felt like a metaphor for a father unable to accept his son’s sexuality. I could be reading into it, but this is how the story resonated for me — the father mourning his lost grandchildren, hating the life his son has chosen, while the mother takes on the role of peacemaker, bringing them together despite her infirmity. While the SFnal elements were wonderful, the ending felt too quick and easy, and didn’t really work for me. It didn’t feel true. The Paper Menagerie by Ken Liu. This is, in my mind, a good example of that sense of truth I’m talking about. Jack’s mother was a mail-order bride from China. When he’s young, she makes origami animals and infuses them with life: a paper tiger purrs and prances, the tinfoil shark swims, and so on. It’s amazing and beautiful. But as Jack grows older, he rejects his Chinese heritage, wanting to fit in with his “American” peers. In doing so, he rejects his mother as well. Only after she’s gone does he learn the rest of her story. There is no neat ending here, but there is … understanding. Movement. Regret and loss, but with a thread of connection through the story’s magical element. One of the things I admire about this one is that it’s not overstated. Jack has little understanding or compassion for a mother who sold herself in a catalog, but there’s a line later on where he’s prepping resumes and says, “I schemed about how to lie to the corporate recruiters most effectively so that they’d offer to buy me.” It’s just one line, and Jack doesn’t see the connection, but the reader does. One line is all it takes. This story has already won the Nebula award, and I wouldn’t be surprised to see it take the Hugo as well. Yeah, it’s really good. This kind of story could become preachy, but it never does. It is what it is, unapologetic and disturbing. Yu takes advantage of the shorter insect lifespan to show the evolution of a new line of bees: anarchists who set out to create a new future. Like Liu’s story, the ending isn’t neat or happy, but it feels right. There’s a sense of movement that feels circular even as it moves forward. There’s a lot going on in this one, and I may have to reread it to catch things I missed my first time through. Discussion is welcome, and since the stories are all online, you don’t even have to be registered for Worldcon to read them.